Enter the Rexel Optima 20 Electric Stapler, a fast, compact stapler that guarantees jam-free, automatic stapling of up to 20 sheets when used with Optima Premium staples. It comes with some smart, time-saving features including LED low staple indicator and detachable staple remover to help you work more efficiently. Simple: just insert your paperwork into the Rexel Optima 20 Electric Stapler and it will instantly and neatly staple your documents together ready for the next batch. Fresh staples can be front loaded quickly at a simple push of a button for minimal down-time. This half-strip model hNEWs over 105 staples so you won't need to break off constantly to refill. Compact: measuring 90mm (height) x 85mm (width) x 255mm (length), the Rexel Optima 20 Electric Stapler weighs in at just 617g, making it easy to move around the office. It won't take up valuable desk space and will fit neatly into a drawer to keep your work station clutter-free. Accurate: the Rexel Optima 20 Electric Stapler comes with integral staple placement guides so you can be sure that every set of papers will be identical for a professional finish. Intuitive comfort-grip user control ensures you're in charge of exactly where the staple goes and when it is released for 100% accuracy. Efficient: time is money, and the Rexel Optima 20 Electric Stapler comes with some useful features to maximise efficiency. The adaptable throat depth allows for greater flexibility in staple positioning, an LED low staple indicator alerts you to refill before you run out of staples whilst the built-in, detachable staple remover ensures you have all the essential tools to hand.Versatile: handheld or desktop stapling, this dual-powered stapler offers maximum flexibility depending on the task in hand. Perhaps you're attending a conference with lots of information to collate? Simply fit 4 x AA batteries (not included) to keep your paperwork in order. 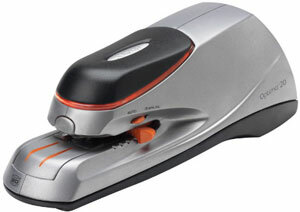 For high volume stapling back in the office, use with the UK AC adaptor supplied. Reliable: featuring a robust, metal mechanism, strong silver plastic casing and comfortable rubber grip on handle and base, the Rexel Optima 20 Electric Stapler is a stylish desk accessory that's built to last. It comes with a 5 year warranty, so you can purchase with confidence.